About three years ago I had my first pumpkin pie made from freshly roasted pumpkin and my inner pumpkin pie lover hasn’t been the same since. Pumpkin pie, pumpkin muffins, pumpkin soup, or just about any other pumpkin recipe have a deeper, richer, and more complex pumpkin flavor when made with homemade pumpkin puree . They are just…well…more pumpkinier. But seriously, like most other whole foods, pumpkin you cook at home is far superior to what you can buy pre-made in a can. For all of the reasons you would choose to make any other food from scratch, you will want to make your own pumpkin puree. The flavor will be better and you’ll know exactly how it’s handled and cooked. Even better, making your own pumpkin puree is almost as easy as making a trip to the store to buy it in the can. While it’s somewhat messier, it’s really quite fun to gut and roast a pumpkin. Think of it as pumpkin carving for foodies. Even better, you can roast a whole bushel of pumpkins – okay, maybe a few less than a bushel depending on the size of your oven – and then freeze your puree for several months to use throughout the fall and winter cooking seasons. And if you’re dreading gutting a huge pumpkin like the one you use for the Halloween Jack-o-Lantern, I’m happy to report that smaller pie pumpkins, also known as sugar pumpkins, are what you’ll need for cooking, so you can wrangle them easily on your kitchen counter. You’ll need to put a little oomph into splitting them in half, but with a sharp and sturdy chef’s knife and a little arm strength you can have several pumpkins cleaved in half in no time flat. They have fewer seeds so you’ll have them cleaned before you can say “Peter, Peter pumpkin eater.” Really, there’s just no good excuse to not roast your own pumpkin. I’d love to be able to tell you that one sugar pumpkin yields a specific number of cups of puree, but of course mother nature isn’t that neat and orderly. The other day I got five cups of puree from three pumpkins, but last year I got seven cups of puree from three pumpkins that didn’t look much bigger than the ones I bought this year. Given how nicely the puree freezes though, you can roast an extra pumpkin and freeze the rest for later. Cut the pumpkin in half with a sharp and strong chef’s knife. Scoop out the seeds and loose fibers. 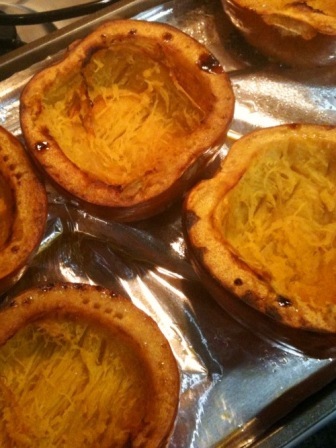 Place the pumpkin halves on the baking sheet cut side up and drizzle with the oil. Use your fingers or a pastry brush to spread the oil evenly over the pumpkin flesh. Roast the pumpkins for 45- 60 minutes (or a little longer for bigger pumpkins). The pumpkin is done when a fork slides easily in and out of the side of the pumpkin. If you get any resistance leave the pumpkins in the oven for another 5-10 minutes. You’ll need to be able to mash the pumpkin easily with a fork. Remove the pumpkins from the oven and let rest until cool enough to handle, about 15-20 minutes. Peel the pumpkin skin away from the pumpkin flesh and discard. Place the peeled pumpkin in a medium mixing bowl. Use a fork to break up the larger pieces of pumpkin flesh and then stir to a smooth consistency with a wooden spoon. You can also puree it in a blender if you’d like with a little water mixed in for a slightly thinner puree, but the by-hand method works just as well. Refrigerate until ready to use and freeze leftovers. Trust me when I say you don’t want to skip on lining the rimmed baking sheet with foil. Pumpkins have a lot of natural sugar in them and you’ll find yourself scrubbing at your pan (or buying a new one) if you don’t protect it with some foil. Don’t worry if you can’t get all of the strings out of the center cavity of the pumpkin. After the pumpkins cook you can easily scrape them out and discard them. As you start to peel the pumpkin it will come apart in chunks. This is perfectly okay because you’re going to be mashing it all together anyway. I recently bought a can of pumpkin puree for a recipe I made over the weekend. Funnily, I picked up a pumpkin to carve on the same trip. Too bad I can’t repurpose my Halloween pumpkin into puree- might be a tad smokey tasting after burning a candle in it for a few nights, though. Seriously, that canned puree was so unappetizing, I’m vowing to make my own next time. Thanks for this recipe, Natanya! I’d definitely like to try to make my own pumpkin puree so this post came at the right time. This is such a great resource for pumpkin and winter squash recipes. Great ideas for bake sales to make things a little different this year.